Pre-Requisites: No prior web design experience is required, however we do recommend you have taken our Internet 101 class first. Also, If you are planning to use Microsoft Frontpage to edit your web pages, we recommend Frontpage 101 before this class - although this is not required. Also, Word 101 will help you as well. 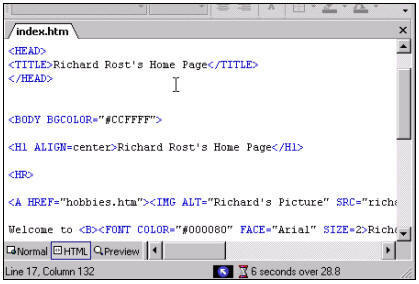 We use basic text-based HTML in this course. 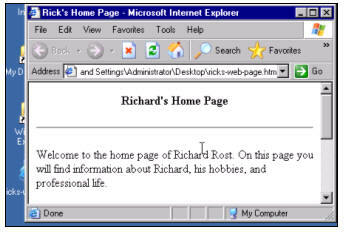 For the student, it does not matter what operating system, HTML editor, or web browser you use, however, we will use Windows XP, Windows Notepad, and Microsoft Internet Explorer in class. This class is for anyone who wants to learn how to design or edit web pages. Whether you've never edited a page before and want to learn HTML from the ground up, or you're currently using another editor like FrontPage and want to learn how to "tweak" your HTML, this course is perfect for you. We will begin this class with a brief review of some of the Internet-related concepts and keywords we learned about in Internet 101. We will then learn some additional concepts related to HTML. We'll then take a look at how to view the HTML source behind any web page, and we'll talk about the different components of HTML. 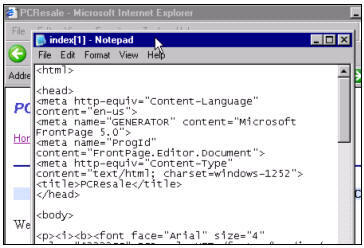 We'll learn about the different tags that make up an HTML page, like the <BODY> and <HTML> tags. Next, we'll discuss HTML editors, and which kind of editor you should use. We'll use Windows Notepad for our editor in class, so we'll load up Notepad and take a look at it. We'll type up a real short example web page, and then show you how hypertext tags work. We'll look at some of the more important tags you can use in your pages, such as the TITLE tag which sets your page title, and is very important for search engine placement. We'll learn about properly formatting your page with paragraph breaks, line breaks, horizontal lines, and more. You will learn how various techniques for formatting your page, text, and paragraphs... like how to horizontally align your paragraphs. We'll talk about Header tags, and why they're important. Next, we'll spend some time learning all about hyperlinks. You'll learn how to create external hyperlinks to other web sites. 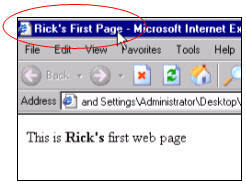 You will create internal links to pages in your web site. And, you will make mailto links to send email to people. You will learn how to properly manage your web site files in folders, and how to organize them. Next, we'll learn all about putting graphics and images in your web pages. You'll learn how to insert an image, resize the image, change the alignment of the image, and how to make text wrap around it. We'll even teach you how to make the image a hyperlink, and adjust it's border size. You'll learn how to change your text font, font size, and color. We'll also show you how to change the background color of your page. You will learn how to create bulleted and numbered lists. Finally, we'll discuss using FTP to upload your files up to your web server. We'll also talk about how to edit your HTML in FrontPage, and the benefits involved. Again, whether you're trying to learn how to make web pages from scratch, or just want to learn how to edit HTML, this course is the perfect start. We'll cover additional HTML tags and techniques in HTML 102. Richard on 1/1/2007: This class is for anyone who wants to learn how to design or edit web pages. Whether you've never edited a page before and want to learn HTML from the ground up, or you're currently using another editor like FrontPage and want to learn how to "tweak" your HTML, this course is perfect for you. Leroy Diaz on 1/23/2008: now this is a lesson i wanted to learn for a while thanks for bringing this out. Richard Rost on 1/23/2008: You're very welcome. More HTML lessons will follow soon. 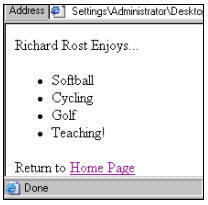 Richard Rost on 2/2/2008: If you have an image that you made in Microsoft Paint, the easiest way to get that into your web page is to save it as a GIF or JPG (don't use the native BMP format). Then copy the file to your web site and include it with the IMG tag like I showed you in class. I have learnt so much from this course html/101. and was wondering are you going to make anymore lessons on html. Thankyou so much for helping me with my studies. a picture on a website? I want to put my picture on the left side of my web page. Richard Rost on 1/19/2009: In your IMG tag you can specify ALIGN="center" or ALIGN="right" if you want to move the image. I personally recommend laying the page out with a TABLE to position the image exactly where you want it. Karl Peters on 5/28/2009: Wow, didn't realize just how easy it was to create a simple web page utilizing HTML code. I've seen source code before, but never really understood it. Just like your VB courses, you broke it all down and simplified it for all of us non Einstein's out there. Great course! Looking forwared to the HTML 102, also looking forward to the VB 203 as well. Kathleen Shea on 7/30/2009: I am only on lesson 5 HTML 101. So maybe the answer is down the line.I am wondering if there is a "list" of all the commands you have shown.If I were working on this I would need to look them up cause I cannot memorize. Richard Rost on 7/31/2009: Kathleen, I have not yet compiled a list of all of the HTML tags because I've only completed one HTML course as of right now. I plan to make more, however, and yes, I'll make a comprehensive list of HTML tags when I do. but you use all Capital. etc. Is there any difference between small and Caps? Richard Rost on 8/29/2009: There is no difference between lowercase and uppercase letters in your HTML tags. They're not case sensitive. the page like hobbies and try to open it doesnt open the page.I already copy and paste the page and rename it.? Richard Rost on 10/30/2009: Ted, I would need to see what you've got going on there in your document in order to tell you. Gordon Youd on 12/31/2009: Richard, I have created a web page and when I do a SEO check on it, one of the things it comes back with is BoldText Blocks 0. It says I need to put some BoldText Blocks on my page. I have some bold text so this confuses me. Richard Rost on 12/31/2009: Aside from the obvious (bold text) I've never heard of the term "BoldText Blocks" and I've done a lot of SEO (Search Engine Optimization, for those of you who have never heard of that term before - it's making the search engines LIKE your site so you get a better index.) What's more important than bold text is properly using HEADERS (H1, especially) and meta tags like TITLE and DESCRIPTION. Rex on 5/6/2010: Where is the "class web page"? The PCRESALE.NET web site is currently offline. I'm switching web hosts. It should be back online soon. You don't really need to see my site to build your own. Just follow the videos. Wilma on 5/15/2011: When doing an ordered list, is there any way of specifying the space between the number and the list item? I am studing your HTML 101 class. I have a problem in that. When you link your home page to your hobbies page and you goto source and open up a new notepad page for hobbies and edit that page but in my computer i am not able to edit my hobbies notepad page. What does it say when you try to edit it? its showing number along the text, it has assigned 1,2,...and so on to all the text.All the tags are red in color.I am not able to add any text to my hobbies notepad,its not saying any thing else. The cursors is not showing up. I'm using window 7. I would like to know where i did wrong,iwas try to creat my first web page by using HTML.when i was copy original page in oder to creat "hobbies" when i click view and then source i get original but i can't Edit it in oder to creat hobbies. The web linking with hobbies does not work. It keeps telling me that there is no webpage with that name. Is there a way to see it work without having an actual webpage? The page might be not be live anymore as this is an old video. Most web editing program's have view page in browser option. This will show a local copy you have saved on your machine. This is what shows up after I copy and paste. It will not allow me to go from page to page.. What am I doing wrong? Tsuning Garrity on 8/3/2016: Microsoft SharePoint have a little bit of the HTML, but do you have video tutorials for Microsoft SharePoint? None for SP at the moment, there is an old basic HTML course. Or you could take the ASP courses, that has some HTML in it too.